Get a complete guide of this software which will help you to understand its working methodology. Know step by step, how this software converts PST file into various other formats. Download and Install this software from our site. Open this software by going to Start > Programs > Convert PST Software. You will prompted to this startup screen. 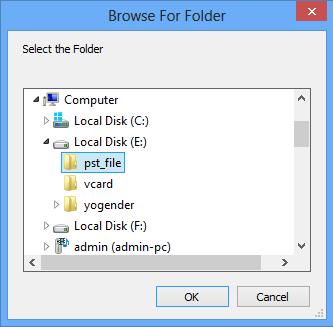 Select checkbox “Search PST File(s) in Sub Folder” to search the PST file inside the selected folder. 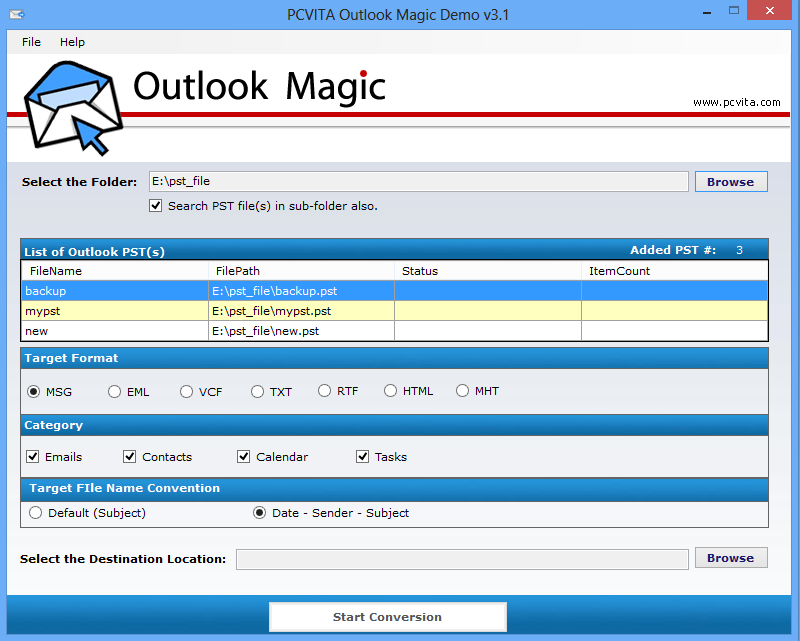 Click Browse button to select PST file/files from particular folder. 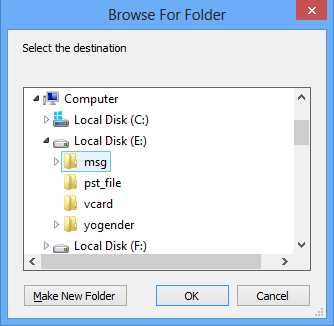 Software will prompt following “Browse for folder” wizard. 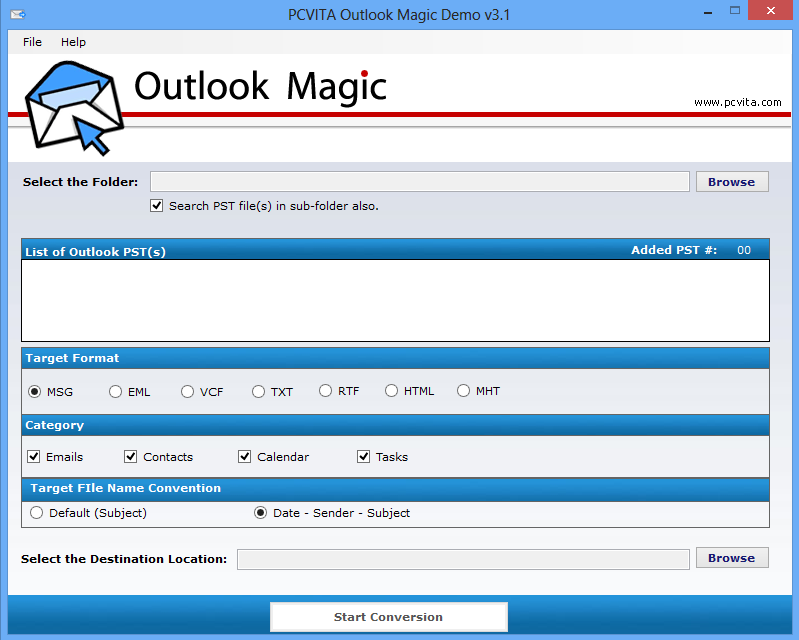 Select the folder containing PST file/ files and Click OK. After that a complete list of PST files will be displayed in software. Select the checkbox of target file format under the Target panel in which you want to covert PST file/files. Here you can also filter out conversion process according to the Category and File Name Convention. MSG - Convert Emails into MSG files. EML - Convert Emails into EML file. VCF - Convert Contacts into VCF file. TXT - Convert Emails into TXT file. RTF - Convert Emails into RTF file. MHT - Convert Emails into MHT file. HTML - Convert Emails into HTML file. Emails – Convert all emails into selected target format. Task – Convert all task selected target format. Contacts –Convert all contacts into selected target format. Calendar – Convert all calendar into selected target format. Default (Subject) - The converted items name will be based on their subject. Date - Sender - Subject - The converted items name will be based on Date-Sender Name and subject. Now Click Start Conversion button to begin the conversion process. As Soon as you click Start Conversion Process, Software will start converting files as indicated by status bar. After completion of this process software will pop up a confirmation message then you can view the target file format files at specified location.